Over the past couple months, I’ve written to you here and we’ve contacted you online to ask for your help and support as Access Press faced some real financial challenges. Many of you in turn reached out to others in the community to make Access Press’s needs known. For instance, the Minnesota Organization for Habilitation and Rehabilitation and the MOHR PR Committee, as well as John Wayne Barker, Executive Director of Merrick Inc., made announcements about Access Press’s statement of need. Thanks to all for getting the word out. Your expressions of confidence in the value of the paper are deeply appreciated. And what a response we’re receiving! On behalf of the Access Press Board of Directors and staff, I want to express our gratitude to everyone for your financial generosity to keep Access Press solvent, and for your many statements of appreciation and confirmations of the importance of the information we supply the disability community. 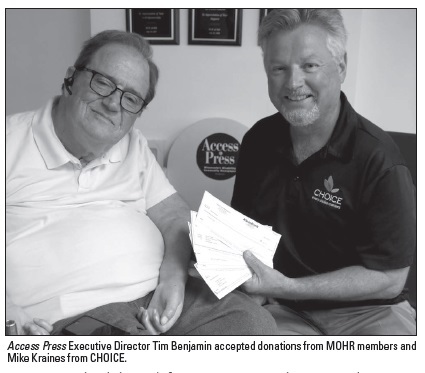 Aaron Hustedde from the Wallace group and Mike Kraines from CHOICE stopped by the Access Press office to give us almost $8000 in donations from their membership conference the previous week. And Handi Medical, our longtime advertiser, gave us a $5,000 check with their best wishes. The donation from these groups is so rewarding to all of us at Access Press. All the donations we’ve received recently, large and small, say that the paper and website remain relevant and serve a need that is recognized throughout the community. The Board of Directors and staff of would also like to extend a special thanks to the UCare Foundation for its generosity. This month the foundation approved a $75,000 grant proposal to help us develop a new 21st century strategic plan, along with a marketing plan and other needed analyses. We are looking at rebuilding our website to make it more accessible and to increase accessibility to all the mobile platforms that people are using today. We are in a good place now financially and able to do the things that need to be done over the coming year to secure a long future for Access Press. members. We will seek your ideas on how best to make the most use of each copy of Access Press. Keep your letters and donations coming, and know that you have re-energized everybody involved in producing Access Press. We hope to keep serving this community as long as you need us. I can’t end a column without talking about the Legislature, but this legislative session seems to have been doomed from the first day, in my opinion. The governor asked lawmakers not to give him a bulk omnibus bonding bill filled with tax cuts and policy changes or he would veto it. Well that’s what the Legislature gave the governor and the governor did not take much time to follow up with a veto. We are now stuck with a 7% decrease in funding to most areas of the Department of Human Services and many other agencies. This may be politics, but it isn’t how government is supposed to work. Enjoy the beautiful summer that’s suddenly arrived, and we’ll talk next month.